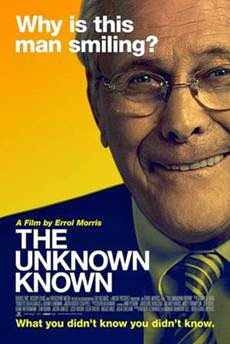 The Unknown Known, a film and character study by doc- maker Errol Morris of Thin Blue Line and Fog of War fame, is a tedious examination of Donald Rumsfeld and his almost half-century career in government and the business world, told through his own eyes. More of a philosopher on screen than a politician, we learn how amazingly deep his thought processes can truly go via a mountain of archived memos referred to as “Snowflakes”. There are thousands and thousands of them across his nearly 50 years of service. As one of the faces behind, first, the Vietnam and eventually, the Iraq War, those who want to know the ideas, questions, concerns and even a few fears held by a power behind Presidents from Nixon to Bush 2, this is a real opportunity. The many Snowflakes examined are like thought processes in progress as he appears to try to work things through in his own mind as well as lead the readers in thought. To dos, definitions, digressions, directives. There is even a scene where he is put in a position to reconsider his famous “Known Unknowns”, a philosophically evasive response (in Feb. 2002) to a NBC reporter when asked about the perceived links between Sadaam Hussein and terrorist groups. His logic dictate illustrated, through side-stepping, that Washington was going to war no matter what the answer to the question was. And that was a bit scary to realize. Morris stated that an MIT mathematician saw the film and noted the many contradictions emanating from Rummy and summed it as this, “In logic, from a contradiction, you can prove anything.” Rumsfeld almost operated each day to avoid something….but WHAT? That and Morris’s statement that “it appeared that we didn’t need covert reasons to go to war….just fear the worst and act as if it will happen.” Seeking to avoid another Pearl Harbor, where a lack of accurate intelligence brought about our downfall in Hawaii, Rumsfeld is almost obsessed that such a thing will not happen again. The film begins on an ocean flyover, metaphorically showing you the surface but causing you to wonder what really was underneath it all. Much like Rumsfeld, himself Rummy is an intriguing character from a body language/facial expression standpoint. Smiles, direct eye contact, averted eye contact, pregnant pauses…all lead the viewer to try to pay close attention to exactly what we are discovering through Morris’s interview. Morris is not seen but heard as he poses the best of his 33 hours with Donald. The dialog is interspersed with plentiful historical footage of Rumsfeld’s extensive career, all set to a Danny Elfman, score which is interesting enough to keep us awake and following along. We get to follow bits and pieces of his career, post Princeton, from 1962, when elected the youngest congressman (From Illinois) at 30, fresh from the Navy. He moves into Nixon’s cabinet, Ford’s Defense Secretary office (for Vietnam), Reagan’s Envoy to the Middle East appointment (some tough times) and eventually back to Secretary of Defense for George W. Bush, post 9/11, and his eventual 2006 resignation, which was called for by many, around the Guantanamo crisis. All the while, Medieval power themes of power-seeking, jealousy, betrayal, lies, manipulations, position-posturing, ambition and conflict intertwining. Rumsfeld is portrayed and behind the scenes, yet quietly ambitious. The Snowflakes become a written web- defining, twisting, turning, directing, contradicting, hiding, evading and providing the public with a glimpse in the man and his mind. He is a person that few really know much about but who held great sway through some of the most eventful and historically changing times in our world. The memos are shown in a vast storehouse as part of Rumsfeld’s legacy…..his history. The film plods on, mildly entertaining. Fascinating I would expect for the history and public policy buffs, the intellectuals and those who go about our Big Business of making War. Morris, in an interview, stated the questions we must also ask ourselves. “Are the memos genuine attempts to understand various policies, decisions or ideologies? Or were they written because Rumsfeld wanted to determine for himself how he might be seen in the future- to create his own first draft of history? Or all of the above?” Morris also stated, “I saw this as a chance to do history from the inside out, using the memos as a way of exploring the disjunction between how Rumsfeld wants to be seen, how he wants people to think of him, and who he really is and what he’s really done.” Morris felt this was the most powerful reason to make the film.